Facebook has announced its adjusted Q4, 2017 earnings which shows the company thoroughly beating market expectations, raking in $12.97 billion in revenues with $2.21 adjusted GAAP earnings per share. Analysts were expecting the company to earn $12.55 billion in revenue with an EPS of $1.95. However, much like fellow tech giants Apple and Microsoft, Facebook is also taking a one-time tax write-off on account of the recently-enacted Tax Cuts and Jobs Act, which resulted in additional tax liabilities of $2.27 billion, reducing the company’s EPS by $0.77. The company is also reporting that its monthly user count rose from 2.06 billion in Q3 to 2.13 billion in Q4, 2017. Average revenue per user (ARPU) climbed to $6.18, which represents an increase of 27% on a YoY basis. Overall, the company made a profit of $4.26 billion ($1.44 per share) after accounting for the one-time write-off. That’s a massive jump from the year-ago period when the company raked in $3.57 billion ($1.21 a share) in profits. Facebook, however, is reporting that people are spending less time on the platform than they did earlier. Overall, cumulative usage declined 50 million hours on a daily basis, representing a 5% drop that Zuckerberg attributed to recent changes the company made to its news feed. The company, however, is reporting an increase in the number of daily active users, which now stands at 1.4 billion, having grown by 2.18% over the previous quarter. 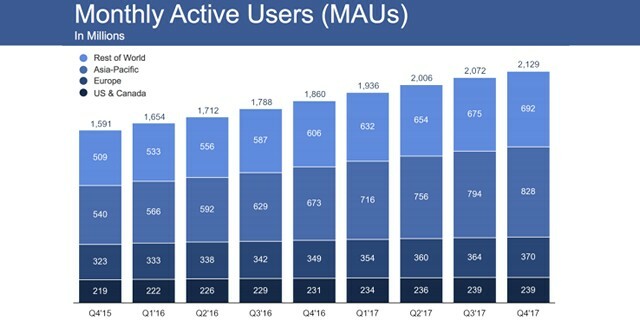 Monthly active users, meanwhile, came in at 2.13 billion, up 3.39% from 2.06 billion in Q3, 2017. “In 2018, we’re focused on making sure Facebook isn’t just fun to use, but also good for people’s well-being and for society. We’re doing this by encouraging meaningful connections between people rather than passive consumption of content”. Meanwhile, it’s not just revenues that’s grown for Facebook. The company also reported that its fourth quarter expenses came in at $5.62 billion, which represents a 34% increase from the same period in 2016.